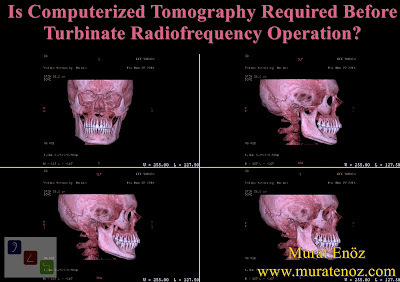 Health Zone Turkey: Is Computerized Tomography Required Before Turbinate Radiofrequency Operation? Is Computerized Tomography Required Before Turbinate Radiofrequency Operation? Normally, paranasal sinus tomography is not necessary before and after turbinate radiofrequency procedure. Turbinates can be assessed by nasal endoscopic examination or simple under-light nasal examination. Patients who need to different nasal surgeries with turbinate radiofrequency may need to nasal tomography. The change in turbinate volume before and after treatment can be calculated scientifically with paranasal sinus tomography as rhinomanometry.